Our Buddhist friends from Taiwan. 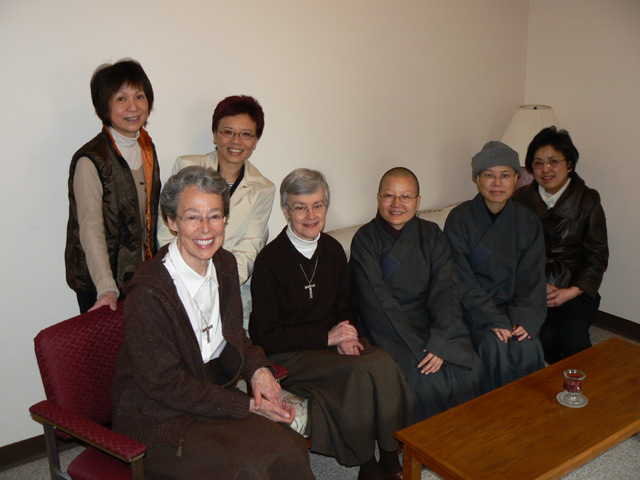 Our first encounter with the Buddhist nuns of the Hsiang Guang Institute, Taiwan, took place in 1999, in downtown Minneapolis. 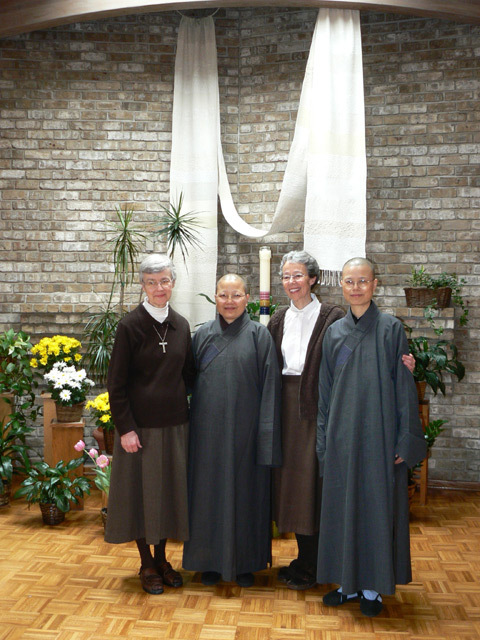 Two nuns of that Order, founded in Taiwan, were in Minneapolis at the request of the Upper Midwest Buddhist Association. They were here to aid the lay Buddhist community by offering teachings from Buddhist masters and instruction on meditation practice. The Buddhist nuns responded so kindly to our greeting and introduction that the conversation ended with an invitation to visit our monastery in Bloomington, south Minneapolis. During this visit, across the boundaries of language and culture, we laid the foundation of a friendship that continues now for over ten years. During those years other nuns from Hsiang Guang have also come to get acquainted. In our on-going conversation, we learn about one another’s beliefs and the practices of our life and prayer. The respect and affection with which we hold one another links our communities half way around the world. 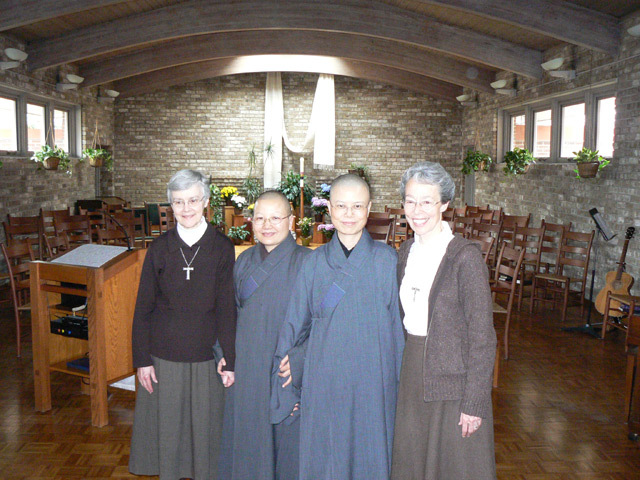 The acquaintance deepened even further when our Sr. Kate and Sr. Doris, from the Cinncinati Monastery, were in Korea in 2004, on visitation of the Poor Clare Monasteries of our Mother Bentivoglio Federation. 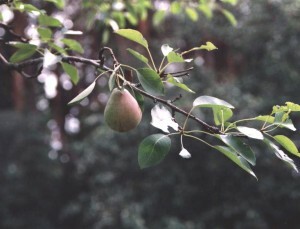 The Sisters, Kate and Doris, went on to spend a week at monasteries of the Hsiang Guang Order. That was a chance to experience first-hand the daily meditation, ritual practice and educational ministry and of these Buddhist women. 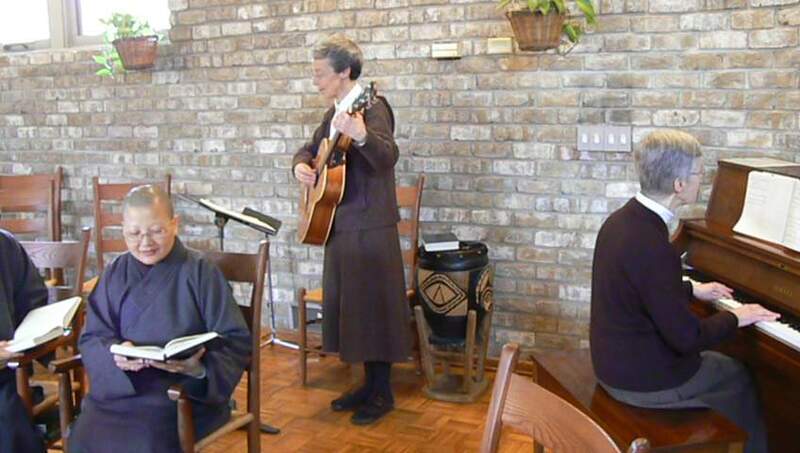 Besides getting to know a number of nuns from Hsiang Guang, we have also met lay members of the Buddhist Associatioin, who host them when they come to Minneapolis to do spiritual education and retreats for the Association. It is very inspiring to meet these devoted lay people and to see the dedication and open-heartedness with which they express their faith. even before the rust of autumn. proving life is more than the sum of the weather.